I pity the people who live here and don’t like winter. Those six months from November through April, when snow falls and ice builds up and winter winds whip through the yard, must be excruciating for those who loath this long season. Mind you, while I feel pity for the winter haters, I certainly don’t sympathize with them. If you choose to make your home in New England, especially northern New England, you’d best embrace winter and all it brings. I’ll admit that in November I miss the long, warm days not long past, and come April I am often beginning to tire of snow. But from December through March I am in winter’s thrall. My love affair with winter has been lifelong. There was little seasonal distinction, when I was a child, in the parental directive to “Go play outside!” In fact, playing outside was encouraged and modeled by our parents year-round, but extra effort was made in the winter. 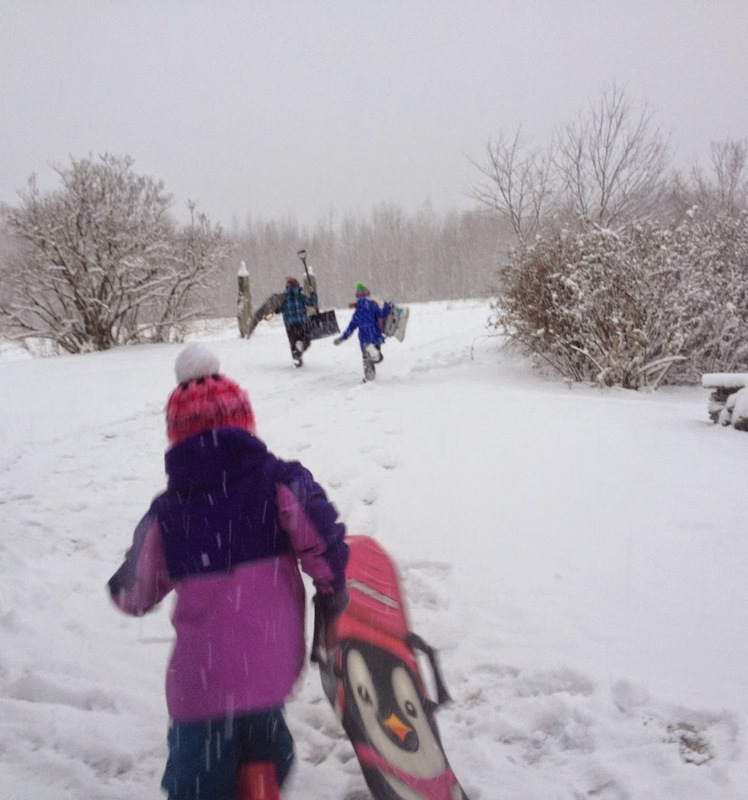 From just before Christmas to sometime around Easter, each Friday afternoon we’d load up the family car with kids, ski gear, and sandwiches for dinner and hit the road for a three-hour drive north. After two glorious days of skiing and playing in the snow, we did the trip in reverse Sunday afternoon. This was repeated every weekend from the time my brothers and I were babies until we all left for college and beyond, and my parents retired to the mountains and gave up the weekly commute. Skiing has always been a central player of my winter days, but it is only one of many things I love about the season. As I write this, a few days before Christmas, the forecast is calling for rain: a four-letter word of the harshest variety for us snow lovers. But the weather prior to this meltdown, at least north of Franconia Notch, has created a winter wonderland this mid-December that rivals any I have seen, showcasing the season’s enormous beauty. We can only hope that winter’s return is swift and plentiful. On the best of wintry days, snow falling in big, fluffy puffs or intricately dainty flakes transforms the landscape to sparkling. Views obscured by foliage in summer are opened up when the trees are bare. Those bare branches covered in a crystal-clear skim of ice or the festive white of winter are quite literally dazzling – the stuff of winter storybooks. Beyond winter’s beauty, if you embrace the cold and snow of the season, the opportunities for entertainment really are endless. There are hills to sled and snow angels to feather into fluff. Snowmen and snow animals to create. Snow forts to construct, with tunnel entrances and high walls and snow benches. Skating on the pond or at the town rink. Snowshoe treks through the forest, where the tracks of myriad woodland animals – along with cross-country skiers and their dogs – crisscross the snowy ground. And when the sky is clear, the early dark of winter eve266nings allows for stargazing just after dinner. Best of all, in winter there is skiing. For this, I drive with my family along the snow-covered-tree-lined roads of my childhood to reach trails on the same mountain where I skied as a kid. The expectation now, in my family, is the same as it was when I was a girl: on winter days we roll out of warm beds to a morning-cool house and prepare for a day of skiing. There are glades to explore and fast runs on groomed trails, chairlift conversations with friends, and the thrill of speed, wind in your face, and the pure joy of being alive. When we come home in the afternoon, with the chill of the day lingering on rosy cheeks, sometimes we light a blaze in the fireplace and sip hot cocoa. Sometimes the kids are content to nestle into a nest of blankets and read a book or watch a movie. Often, though, they are soon back outside, building jumps for their sleds or shoveling a new feature into the snow fort. There is simply too much to do, too many adventures to find and fun to be had, to stay inside. We are on the brighter side of the winter solstice now; the days are slowly lengthening. The abhorrers of winter have that small glimmer to cling to. The winter lovers among us, however, know the fun is just beginning. Original content by Meghan McCarthy McPhaul, posted to her Blog: Writings From a Full Life. This essay also appears as Meghan's Close to Home column in the December 26, 2014 edition of the Littleton Record. Of all the cool things that happen at my kids’ elementary school, I think my favorite is the annual Recycle Sale in December. Judging by the happy buzz resonating through the school during Recycle Sale day this week, that sentiment is shared by the 100-plus students there. Amid a season when children make wish lists for presents and send letters to Santa, the Recycle Sale offers a chance for these youngsters to embrace the giving – rather than the give me – part of the holidays. For a quarter per gift, the kids are able to select one Recycle Sale item for each immediate family member. I remember trolling the mall or the Bradlees department store down the road as a kid, meager allowance in hand, seeking the perfect-yet-affordable-for-a-child gift that would bring Christmas smiles to my mom, dad, and brothers. I can’t remember how many bottles of cheap perfume I gave my mother (who doesn’t wear perfume) or how many neckties my father unwrapped over the years, and goodness knows what I found for my brothers each Christmas. The Recycle Sale allows the children to give gifts with plenty of thoughtfulness, but little of the hassle that often goes with gift-buying. Watching their faces light up when they find that perfect gift – the princess beanbag chair for a little sister, the sparkly earrings for Mom, a Red Sox logo-emblazoned anything for Dad – is purely priceless. Each year families, other community members, and businesses donate items from toys to housewares, jewelry to books, items that are brand new and others that have been used but have lots of wear left – along with the boxes, paper, and ribbon to wrap it all. My children like to add toys they no longer use to the Recycle Sale pile, and I know others do, too. In this way, one kid’s discarded plaything becomes another child’s Christmas morning treasure. It’s sort of like recycling joy. For months these items are left in the school foyer and sorted and stored away by a few dedicated volunteer parents until the Recycle Sale arrives. The day before the sale, the school’s own brand of holiday elves haul the boxes out of storage and lay items out by general category – younger kids, older kids, moms and big sisters, dads and big brothers – on a dozen tables in the school cafeteria. This year’s elves included a handful of moms, the school principal (whose now-grown-up sons shopped at the Recycle Sale once upon a time), the newly-retired teacher who helped start the sale some 25 years ago, and the school’s administrative assistant and her daughter (who was shopping here as recently as a few years ago and seemed captivated by the setting up process). The morning of the Recycle Sale, more helpers arrive, donning red and green elf hats and felt antlers and turning up the holiday tunes as they prepare for the onslaught of kids giddy with holiday cheer. For four hours during the Recycle Sale, children from kindergarten through sixth grade file happily into the room, meandering the maze of tables to peruse stuffed animals and games, puzzles and books, sporting goods, table linens, picture frames and more. Even the cheap perfume and neckties are there. The Recycle Sale elves help children match gift items to recipients, then wrap each present in crisp boxes and bright paper. This is my family’s third year of Recycle Sale giving. The event has yielded many treasures opened on recent Christmases past: glass candle holders, which had to be immediately added to the holiday table; a notebook with someone else’s name on the cover, which my youngest daughter has happily filled with drawings and scribbles; a zippered bag for my husband’s golf shoes; a kit to make personalized birthday cards; various jewelry; a small stuffed horse; and an awesome toy fire engine that was easily worth 100 times its 25-cent sale price. Far better than the gifts, though, is the children’s joy at giving them. On Recycle Sale day my kids came home and jubilantly placed their presents – the first of the year – under our freshly trimmed Christmas tree. Unable to contain their glee, they each whispered to me what they had found for each other. This enthusiasm for giving outshone the excitement over what they may themselves receive on Christmas day. The gift conversation has moved from really, really, really hoping that Santa will bring what they’ve asked for to utterly excited anticipation of their siblings and parents opening the gifts carefully selected at the Recycle Sale. At the end of the day of the Recycle Sale, the children leave school with stacks of carefully-selected, colorfully-wrapped presents for the people they love most in the world. They leave behind a jumble of leftover Recycle Sale treasures, ribbon ends and paper scraps on the floor, and cookie tins overflowing with quarters. Those quarters will add up to a couple hundred dollars, which the school donates to a local charity selected by students. And so the joy of giving is recycled in more ways than one. Original content by Meghan McCarthy McPhaul, posted to her Blog: Writings From a Full Life. This essay also appears as Meghan's Close to Home column in the December 12, 2014 edition of the Littleton Record.